It is one of the most inhospitable places on earth. A sun-scorched furnace of rock and sand 700 miles from the coast: the Central Sahara. Summer temperatures can reach 55ºC. Average annual rainfall is less than half an inch. Sometimes it does not rain for years. Across a 250,000 square mile swathe of it – the Fazzan province of south-western Libya – just 79,000 people were recorded in 1964: one every 8km square. Yet in the middle of it, 2,000 years ago, was an urban civilisation with a written language, pyramid tombs, irrigation, agriculture, and armies of chariots and cavalry: the Garamantes. Until recently, we knew virtually nothing about them. Some ancient writers told strange stories about a mysterious people of the desert. Herodotus, the Greek historian and ethnographer of the 5th century BC, reported that the Garamantes spread humus over salty ground to cultivate it, bred cattle that walked backwards to graze because their horns were too long, and hunted ‘Troglodyte Ethiopians’ in four-horse chariots. With limited evidence – and prejudices of their own – modern archaeologists often followed the ancient sources in denigrating the Garamantes. Mortimer Wheeler, writing in the 1950s, thought they were ‘predatory nomads, who, on their swift camels, were a proved menace from the deserts of the south’. Any evidence of achievement in their homeland – and early archaeological work had revealed some – was ‘difficult to dissociate … from the phase of Roman contact’. Nomadic barbarians half-civilised by Rome? In fact, the ancient sources were not consistent. They sometimes referred to things that did not fit the stereotype – kings, chariots, agriculture, luxury trade goods, a great city in the desert – clues that the Garamantes were something more than desert raiders. Clues, in fact, to a lost civilisation. 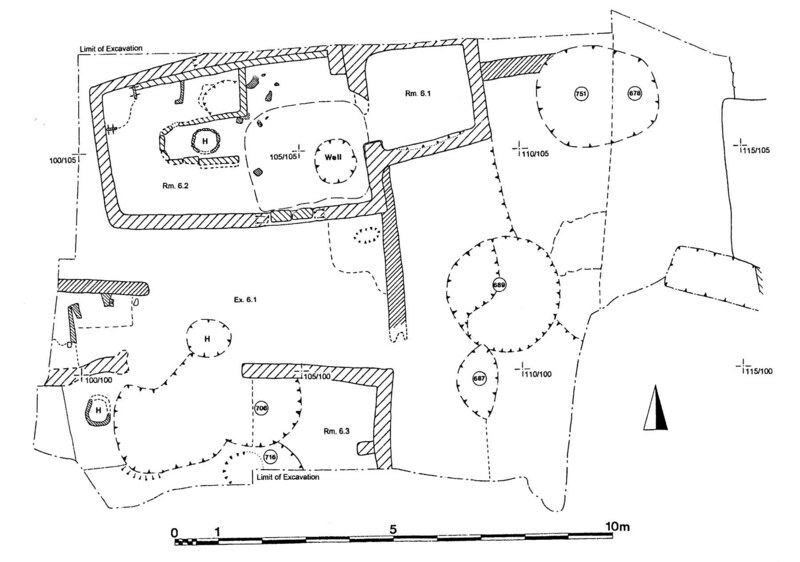 Plan of the buildings excavated in ancient Garama. The city in the Classic Garamantian phase (AD 1-400) comprised monumental architecture and stone-built elite houses as well as the traditional mudbrick buildings of the common people. The capital city was Garama (modern Jarma). Serious research began here in the 1960s under Charles Daniels, the pioneer of scientific archaeology in the Fazzan, but he died prematurely in 1996 with much work unpublished. A new project led by David Mattingly was then set up to publish Daniels’ work and carry out new fieldwork. This Fazzan Project ran from 1997 to 2001 under the joint auspices of the London based Society for Libyan Studies and the Department of Antiquities in Libya itself. For both Daniels and Mattingly, Garama was a main focus, and excavation here has revealed much about the Garamantian capital. The site today is dominated by a mudbrick kasbah – an Islamic castle – evidently of 14th or 15th century date. When European travellers first reached Garama in the 19th century, they found an Ottoman Turkish overlord using the kasbah to store his date harvest. Around the kasbah are the still-standing remains of a medieval caravan city, and beneath this lies a complex sequence of deposits 15 feet deep extending back in time to about 500 BC. Excavating here in the 1960s, Daniels found a group of Garamantian buildings at the core of the site, and these, unlike their mudbrick Arab successors, had been built of quality ashlar stonework. At least two buildings were monumental. One, a temple, approached via a broad set of steps and a columned porch, may have been dedicated to the Libyan desert god Ammon – best known from the famous oracle site in the Siwa Oasis, where Alexander the Great, visiting between campaigns, became convinced he was the son of Zeus. A second grand building nearby comprised a colonnaded courtyard whose narrow entrance was flanked by two engaged pilasters. Also, from fragments of hypocaust tile, hydraulic cement, marble veneer, and painted wall-plaster, it seems there must once have been a Roman-style bath-house on the site. Garamantian houses were usually of mudbrick. David Mattingly’s team excavated two long rectangular buildings, each of two or three rooms, both with a hearth, one of them also with a well. They interpreted these as low-status houses or workshops, or a combination of the two. Mudbrick seems to have come in around 500 BC – at the beginning of the ‘Garamantian proto-urban phase’ (500-1 BC) – and has remained central to the building tradition in the Central Sahara ever since. Ashlar stonework came in later – in the ‘Classic Garamantian phase’ (AD 1-400) – but it was then used not just for monumental public buildings, but also for the grander houses, at least at foundation and lower-wall level. Though mudbrick architecture could be elaborate – including fluted columns of moulded and painted mud – stone-footed buildings made a stronger statement about status. Solidly built, multi-roomed, and roughly square in plan, these houses reveal that, at the time of the Roman Empire, Garama was ruled by a prosperous élite. Comparative plans of excavated houses dating to the Classic Garamantian period (AD 1-400), when Garama was an urban centre and the capital of a desert empire. The houses of the Garamantian élite had stone footings. The two examples here are from Zinkekra (a) and Garama itself (b). The houses of the common people were made entirely of mudbrick and had more irregular plans (c). The period of stone building was short. Before and since the Classic Garamantian period, all building at Garama has been of mudbrick. Excavations by the Fazzan Project at Garama in 1997-2001 revealed two further examples of low-status, mudbrick buildings of the Classic Garamantian period. That to the north comprised two linked rooms. This was entered by a door in the southern side of the main room, where a well and a hearth (with u-shaped surround) were located. The building to the south was truncated by earlier excavations, but the plan appeared to be similar. It comprised at least two rooms and had a hearth, though there was no sign of a well. Presumably these buildings were workshops, houses, or, perhaps most likely, some combination of the two. Garamantian cemeteries also reveal a stratified society, and possibly one that was divided into separate tribes with distinct cultural practices. Over 60,000 graves have been located. While most were buried in simple cairn or shaft graves, some had elaborate monuments. These might be in a Romano-African style, being square, stone-built mausoleums, often decorated with free-standing or engaged columns. Others were of Egyptian inspiration, either stepped ‘mastaba’ tombs of stone or mudbrick, or pyramid tombs of mudbrick; though these latter only ever stood 10 to 15 feet tall, they were often numerous, one cemetery containing over 100. Where, in the middle of the Sahara, was the wealth coming from? Garama is located in the Wadi Ajal, a sinuous east-west depression some 100 miles long and 2 to 3 miles wide. To the north lies the Dahan Ubari, a great sand sea swelling upwards from the wadi, and to the south, the Massak Sattafat hamada, a barren rock plateau raised up on a towering escarpment. The sand and rock deserts on either side are wholly inimical to life; only the wadi can sustain it. Along its length, field surveys have located some 500 Garamantian sites. Many are cemeteries, but, in addition to Garama, there seem to have been several small towns and about 50 villages and hamlets in the Classic Garamantian period. Four thousand people may have lived in Garama itself, with another 6,000 in suburban satellite villages close by, and perhaps as many as 50,000 in the wadi as a whole. This, however, was not the full extent of Garamantian territory. Garama and the Wadi Ajal were at the centre of a wider Garamantian empire. The Garamantes controlled chains of wadis and oases on the desert caravan routes extending over 100,000 square miles, perhaps doubling the total number of the Garamantian king’s subjects. Much of the wealth came from control of the caravan trade. Garamantian camel-trains brought the products of Saharan and sub-Saharan Africa to the Roman cities of the Mediterranean – salt, gold, semi-precious stones, ivory, wild animals for the arena, and natron (a naturally occurring alkali used in embalming and glassmaking). Some things were undoubtedly of Garamantian manufacture – archaeologists have found metalworking hearths (for processing iron, bronze and possibly gold and silver), and evidence for the working of semi-precious stones like the translucent red carnelian and an opaque turquoise known as amazonite. Probably, also, the Garamantes traded slaves. War was the principal source of slaves in antiquity, and the Garamantes were great warriors. 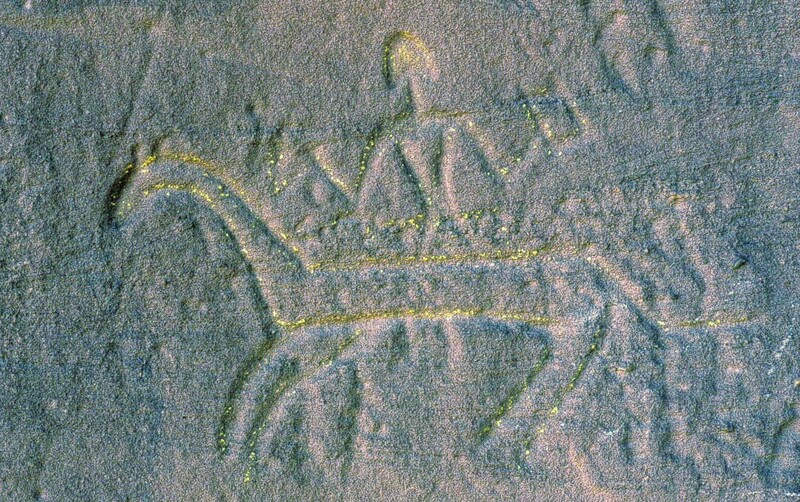 They fought sometimes from chariots, most typically as cavalry – being renowned for their horses and horsemanship – and occasionally as infantry: there are depictions of all three on Garamantian rock-carvings. They wore no armour, fought in loose order, and were equipped with javelins and small round shields – operating, no doubt, as fast-moving and elusive skirmishers. They had used their military pre-eminence to conquer a desert empire, and from it they continued to launch raids on their neighbours – yielding a steady return of war-captives for sale in the slave markets of the Roman cities on the coast. The desert trade, however, cannot explain Garamantian civilisation. That trade continued through later centuries, but medieval Jarma was just a caravan town on the trans-Sahara route, not an imperial capital. Something else had happened under the Garamantes. They had made the desert bloom. In places across the desert surface there are white crusts of calcium carbonate and other mineral deposits, representing ancient dried-out lake beds from a time when the Sahara was far wetter than today. Garamantian society developed after the major period of drying out, after the present hyper-arid desert conditions were established about 5,000 years ago. Much of the water was burnt off, but some was sealed as ‘fossil water’ in underground rock formations known as ‘aquifers’. Water-bearing strata ran near the base of the rock plateau to the south of Wadi Ajal – but at a higher level than the wadi depression itself, such that, if tapped, it would flow down into the valley. Here was the secret of Garamantian civilisation. Garamantian engineers, inspired by irrigation methods developed in Persia and Egypt, dug long underground channels – foggaras – to tap the water trapped in the aquifer at the base of the escarpment and conduct it out into the valley, where it flowed continuously into the oasis and turned it into a Garden of Eden. The channels were generally very narrow – less than 2 feet wide and 5 high – but some were several miles long, and in total some 600 foggaras extended for hundreds of miles underground. The channels were dug out and maintained using a series of regularly-spaced vertical shafts, one every 30 feet or so, 100,000 in total, averaging 30 feet in depth, but sometimes reaching 130. Often cut through sand, gravel and clay, but sometimes through rock, the construction and maintenance of this vast system must have consumed large numbers of slaves – working in the searing heat of the Sahara near the surface, or in the gloom and danger of the narrow passages deep underground. Through their work, the Garamantes cultivated the desert and feasted on locally grown dates, grapes, olives, figs, sorghum, millet, barley and wheat, supplemented with joints of locally reared beef, lamb and pork. How the foggaras worked; an idealised plan and transverse section along a length of Garamantian foggara – an underground irrigation channel. Conquest, raiding, the caravan trade, and rich irrigation agriculture: these gave the Garamantes the resources to build an urban civilisation in the desert. Where had these extraordinary people come from? Greek and Roman writers sometimes imply the Garamantes were like the Berbers of north Africa, sometimes like the Negroes of sub-Saharan Africa. Skeletal evidence supports this: the Garamantes seem to have been a mixture, much as we might expect; similar that is to the present-day population of the Central Sahara. Probably, too, they were a confederation of desert tribes, whether formed willingly or through the dominance of the group centred on Garama. Some may have migrated to the Fazzan from oases further east, nearer Egypt, bringing some of the techniques of civilisation with them. As well as irrigation, masonry building, and forms of architecture, the Garamantes introduced the horse, the camel and wheeled transport to the Sahara. They also brought writing – short funerary inscriptions in the ancient Libyan language are rendered in a script formed of circles, crosses, squares, arrows and zigzags. The mélange of native, Egyptian and Graeco-Roman elements apparent in temple design and funerary monuments implies some such cultural mixing. But most Classical period Garamantes were probably descendants of the local Neolithic farmers who had arrived in the area around 1000 BC, building a series of small hillfort settlements along the escarpment at the edge of the wadi. Left: Garamantian cavalry. 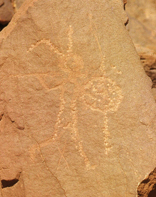 A rock carving from Zinkekra in the Wadi Ajal showing an armed horseman – he appears to carry a weapon in his right hand and a shield in his left – standing beside his mount. This ‘horse’ or ‘caballine’ style is thought to date to the 1st millennium BC. Light cavalry who operated as raiders, guerrillas and skirmishers were probably central to Garamantian warfare. Right: Garamantian infantry. This rock carving, also from Zinkekra in the Wadi Ajal, depicts a foot soldier. He appears to wear a short tunic and a plumed helmet or headdress. He is armed with a round shield and javelins, one of which he is throwing, while he holds the other in his left hand. However spectacular the achievement, Garamantian civilisation did not last. When Islamic Arabs invaded the Fazzan in 666-67 AD, there was still a king at Garama, but his power had waned, many of the foggaras had ceased to function, and the population was shrinking to the smaller number that could be supported by well irrigation – much less efficient, since water had to be raised mechanically by muscle-power in buckets. What had gone wrong? We cannot be sure. The decline of the cities in Late Antiquity may have reduced the market for trans-Saharan traders. The Garamantian kings’ grip on power may have slipped and the supply of slaves to maintain the irrigation system run out. Or perhaps the aquifers ran dry. Certainly they are dry now. It is estimated that over six centuries the Garamantes extracted 30 billion gallons of water – non-renewable ‘fossil water’ – and the water-table must have gradually dropped until, perhaps, it fell below the level of the foggaras and left them as dry as the desert. And then the civilisation of the Garamantes shrivelled in the sun and disappeared beneath the sand.